Here’s a fact: experts estimate that the cost of replacing a team member is equal to approximately 100 to 300% of that employees annual salary. And given that around 25% of employees leave their jobs in any given year, that is quite a cost. So perhaps the key is in motivating employees rather than replacing them. For example, research by the Harvard Business Review, has found that being motivated and getting a higher level of achievement from work is associated with a 93% increase in employee engagement. No doubt, employee retention and engagement are strongly connected, and success in both spheres is one of the biggest goals of many companies today. We have selected 20 HR tools, that can help teams stay engaged and motivated. Here are the first ten (in reverse alphabetical order). 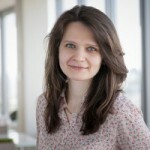 Eugenia Bereziuk is a business analyst at CactusSoft, an international organization that provides a full range of services required to build, adjust or improve HR or Business process in a company. She was a reporter and an editor for a decade and worked as the head of a financial department, and then as the chief of special reporters. In addition to her primary job, she is chief editor of WISP HR blog, where contributors discuss ideas around technology, the digital world, human resources, and HR tech. Tweet at Eugenia Bereziuk. The Zeal team have created tools for measuring organizational culture to improve low morale and ensure you have happy employees. You don’t need to install any app and there is no website to log into. Simply add Zeal to your favorite messaging app, and you are ready to go. 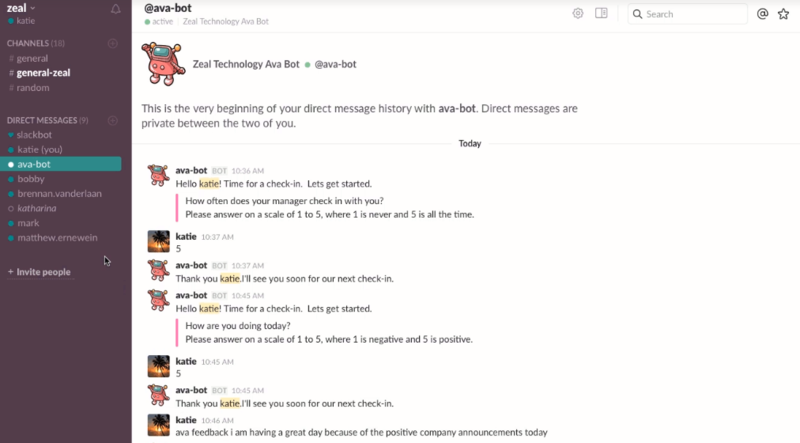 Information about employee morale and corporate culture is collected by a personable chatbot named Ava, who interacts with employees, asking questions about how people are doing. She conducts check-ins at regular intervals and delivers data and analytics to talent managers and executives, providing the information they need to build an engaged workforce and positive organizational culture. You can take a free trial for 30 days. The price is $3 per user, per month. 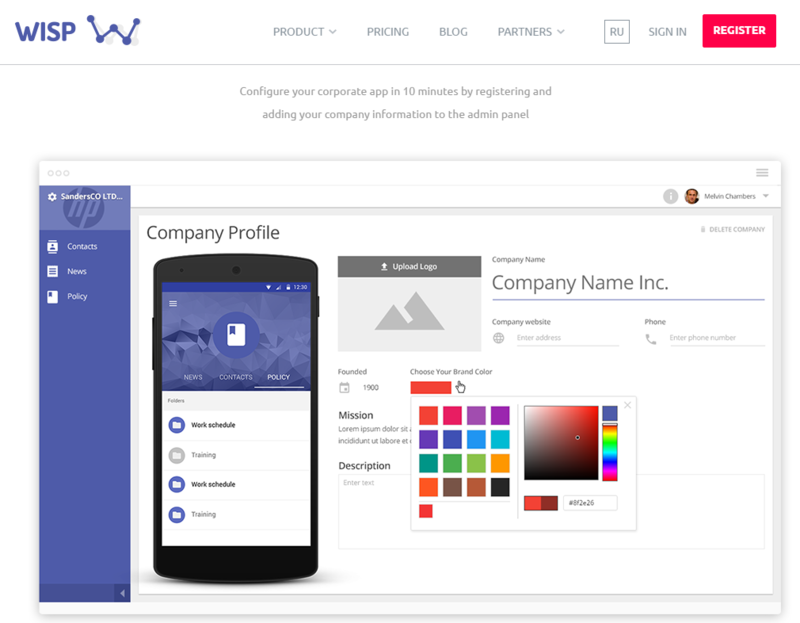 WISP is a HR solution which helps teams to create an employee app in 15 minutes or less. It helps managers with onboarding new hires quickly and increases employee engagement. There are lots of advantages to WISP. The first being, that HR personnel who have any level of tech knowledge, can add use this employee app to manage their team’s communication easily and effectively. And all changes made with the web admin panel, automatically sync to member’s phones. It has multiple functions too. After creating a team profile you can add all of the team member’s contact information, by uploading it all at once, or one by one. WISP messenger allows users to communicate, share files and discuss updates. And HR personnel can create folders with documents, company polices, and other key information they need to share with their employees. It’s easy to post updates, create polls and comment on them. The WISP team use a combination of stable technological solutions and reliable security and privacy controlling methods to protect customer data. WISP was listed in 100+ HR Technologies Worth Watching in Q4 2016, by HR professional William Tincup. It is free for the companies of up to 9 employees. Subscription plans for medium sized companies start at $49/month (which includes up to 49 employees). Waggl is a pulsing platform, designed to enable focused communication on enterprise topics such as culture, events, change, strategy and talent. It is designed to elevate people’s authentic experience and deliver the analytics leaders need. It allows getting employee feedback quickly without the need for long, time consuming surveys. HR personnel can create a question from one of the Waggl’s templates or start from scratch to collect employee feedback. You can use a rating question (such as an agreement or net promoter for pulse measurement) for open ended for surveying. 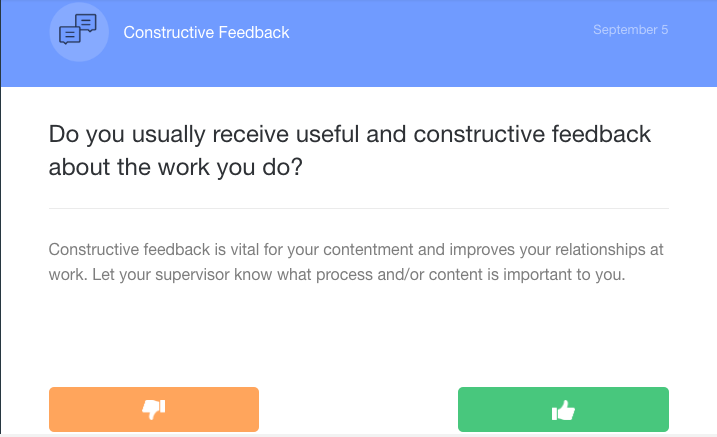 People can answer immediately and you can see feedback within minutes. It is free to take a trial. VibeCatch is a fast, feedback collection and quality of work life analytic tool, that checks employee satisfaction in real-time. It provides you with a Quality of Working Life (QWL) survey based on the method of the academic Marko Kesti, adjunct professor of University of Lapland, who has specialized in HRM-performance. To start VibeCatch you need to enter employee’s email addresses and then you can have the simplest poll up and running in minutes. Recipients can answer on a PC or on a phone and you can check levels of employee satisfaction in real-time. You can take a free trial, get a standard plan for $1 per user, per month, or a premium plan for $2 per user, per month. This is an employee cloud-based survey platform that allows you to continually monitor and understand employee mood and engagement. 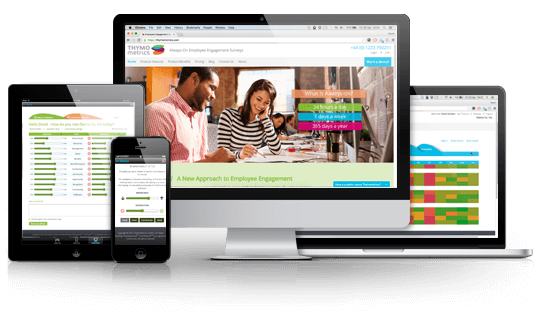 The Thymometrics team have transformed the annual employee engagement survey into an always available, real-time, employee feedback platform, which helps you keep your finger on the pulse of your company all year round. Just set up your survey and get the analysis back in real-time. Thymometrics users are able to seek employee input not just annually, but daily throughout the year, giving managers a continual view of shifting moods as they happen. Dashboards and detailed analytics enable an at-a-glance view of all factors across the entire company or enterprise. You can track changes over time to ensure your initiatives are generating positive impact, and head off any negative shifts or developing trends. Teambay is a tool, that gives you simple, continuous feedback. To understand the level of your team’s satisfaction and happiness at work, Teambay asks diverse and simple questions every week. For instance, “Do you understand how your role contributes to the success of your company?”. A set of 45 questions are developed from decades of research papers and studies on employee engagement, employee satisfaction and employee productivity, to give you a full year’s analysis of your organization as a workplace. A question is sent to your team via email every Friday at 4pm by default. Employees can give an anonymous answer, if they wish. Managers receive a simple analysis across departments, gender and seniority levels and can also see how similar company’s employees answer Teambay questions, in comparison to their own. Pricing is based on your company’s size. Subscription plans for small companies start at €119/month (up to 49 employees). A simple, anonymous, real-time, feedback tool. Nfactorialanalytics delivers questions one at a time (on both mobile devices and desktop computers) making it easy to get feedback without survey fatigue. You can create anonymous groups of happy, unhappy, engaged or disengaged employees across different categories and have multi-threaded conversations with up- and down-voters, in order to obtain deeper insights. Collected data can be used to develop predictive models, which can help to predict employee attrition and churn, using sentiments and insights extracted from employee mood and textual responses. This is a great piece of employee engagement software. With a cloud-based, mobile solution, employees can connect with each other, their goals and the company’s mission, vision and values. HighGround provides a “report card” summary of all the interactions tracked in the application throughout the year, including recognitions received, goals achieved and snapshots of coaching conversations. This allows managers to quickly celebrate accomplishments and set new goals. Managers and employees alike, no longer need to spend countless hours tracking the history of what happened six months ago. The review documentation is essentially built and ready to go. A mobile-friendly platform that helps to manage employee performance, motivation and learning. 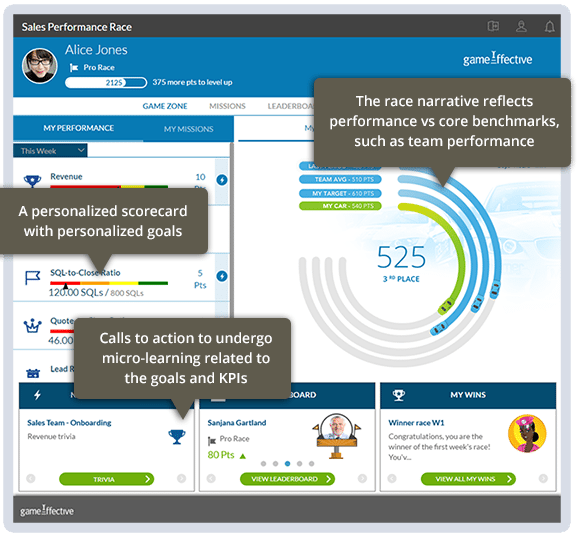 Using Gameffective you can give your employees feedback, as KPIs show them how they are doing in real time. More importantly, they show them what’s important and why. Using gamification mechanics, leaders are able to manage employee behavior by setting goals and tracking progress towards them. The solution is full of micro-learning and communications to ensure employees are always in the loop. This platform combines pulse surveys, analytics and integrated action planning to HR, leaders, managers to affect real change in organization and increase employee engagement. 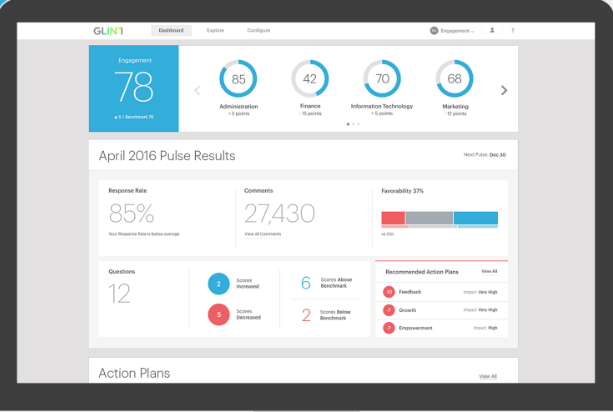 Glint provides real-time insights, powered by people. It captures frequent feedback and assesses results in real time. This gives HR teams, leaders and managers the ability to make sense of engagement data, connect insights with outcomes and to take meaningful action.